There is nothing better than a perfectly cooked roast for a large family dinner. And this traditional Greek lemon chicken recipe never fails to impress! ‘Kotopoulo lemonato’ is a traditional Greek recipe for oven roasted chicken or let me rephrase.. this Greek lemon chicken recipe is with no doubt the most delicious roast chicken you have ever tried! It’s simple preparation and presentation, which is part of the Greek cuisine, takes nothing out of it’s exquisite taste. To prepare this super easy Greek lemon chicken recipe all you have to do is just put all the ingredients together and let the oven do the rest! Perfectly moist and succulent roast chicken combined with fluffy potatoes, garnished with fresh herbs and baked in a delicious lemony flavoured sauce to form an amazing full of Mediterranean flavours hearty dish. This amazing traditional Greek lemon chicken recipe is the brightest example of how Greek cuisine takes the simplest ingredients and with literally no effort transforms them into a finger licking dish! 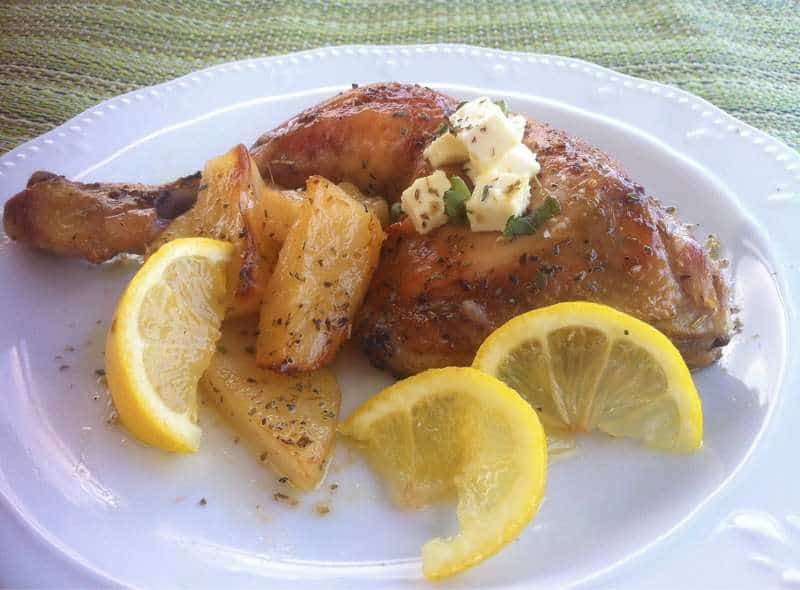 To prepare this Greek lemon chicken recipe select some good quality chicken. Start with the best available bird, free-range or organic. (Watch out for the labels. The best choice, for the best-tasting roast chicken with no unnatural additives, is to go for the ‘USDA Organic Certified’. Next best thing ‘No Antibiotics Used’, ‘Certified Humane’ and ‘Pastured Poultry’). In Greece when preparing ‘kotopoulo lemonato’ (Greek lemon chicken) it is almost a rule to add the potatoes in the same pan with the chicken, so that they get all the juices and aromas from the meat. The main drawback is that the potatoes are not that crispy as when baked on their own. So it’s up to you to decide if you want to sacrifice a little crispiness for extra flavour. (If you choose to roast your potatoes on their own then try these extra delicious crispy Greek lemon potatoes). Don’t forget to top with some salty crumbled feta cheese for extra flavour! Enjoy! To prepare this Greek lemon chicken recipe, divide the chicken into 8 portions and wash thoroughly. Peel the garlic and rub on the chicken. Place on a large baking tray and season well with salt and pepper. Cover with aluminum foil and bake in a preheated oven at 180C for 60-75 minutes in total. 50 minutes into the bake remove the aluminum foil and top the chicken with some feta cheese. Bake for another 15-20 minutes (the remaining time), until your Greek lemon chicken is nicely colored and crispy on the outside. This Greek lemon chicken is ideally served with a refreshing Greek feta salad and lots of sourdough bread aside to dig into all the delicious sauce!! Are the potatoes peeled or unpeeled? Hi Eli, how many does this serves please? any reason why you can’t give the amounts/measures in English? Plus, printing the recipe took up four pages. On other sites when you hit “print” just the ingredients/directions print. Measurements ARE in english. The US is the only country that doesn’t use he metric system. THERE are many websites that you could check to get the US equivalents to the metric measurements the rest of the world uses.